Bingo has enjoyed plenty of revitalization in recent times and now it’s a game that has seen an incredible revival and continued success, mostly thanks to new variations and the rise of the mobile gaming market with new bingo sites springing up all the time. Even the world of film and television has got in on the act, with the game slowly creeping back onto our screens. Here are just some of the best bingo references we were able to hunt out. It’s not very often that spin-offs get just as much high praise as their predecessor but ‘Better Call Saul’, the remarkably impressive prequel series to the award-winning show ‘Breaking Bad’, has enjoyed continued success. At the heart of its success is some amazing writing but of course what makes it work so well is the likability of Jimmy McGill, played by Bob Odenkirk, who reprises his role from his ‘Breaking Bad’ days. 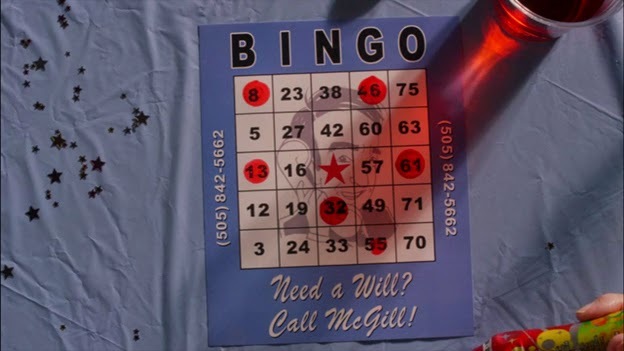 In one such episode McGill, AKA Saul, is in charge of bingo calling at a local old folks home. But thanks to a number of stress-building incidents which led up to this afternoon he decides it’s probably the best time to snap and head into a little breakdown of his own spouting off anecdotes, opinions and other general gripes. And it’s fantastic to watch. Stuntman star Johnny Knoxville stars in this outrageously funny ‘Jackass’ spin-off which sees him once more plaster on the ‘ageing’ makeup and become ‘Bad Grandpa’ Irving Zisman. In one unforgettable scene Irving takes part in a bingo game in a packed-out hall filled with other elderly patrons. Of course, he was his typical bad self, irritating other players and even shocking those around him after he began drinking the fluid from the bingo marker pens. Director Uwe Boll’s back catalogue of features have gotten quite a lot of stick over the years but 2009s ‘Rampage’ was certainly a lot of fun. Focusing on a vengeful guy who decides to build himself a Kevlar suit and go on a killing spree. Along his way he stops by a bingo hall and despite his best attempts to get noticed, even with his suit and brandishing his weapons, he gets very little attention indeed thanks to the well immersed patrons enjoying their bingo. But it’s definitely the sort of situation which would make you want to play bingo the safer way, in the comfort of your own home.